Ah, the tumultuous restaurant business. Or maybe Hurley, who once took Portland by storm with his eponymous restaurant, Hurley’s — whose rise and fall was chronicled in the Oregonian — is just spread too thin? Tom? Feel free to comment, below. 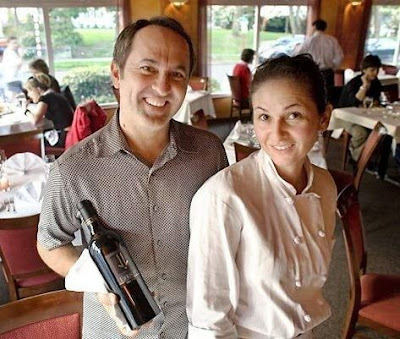 Coupage is now on the market, Carlos said, adding, “Mike Walker at [Madrona’s] Hi Spot said Hurley’s asking $350,000.” Which is far more than Kainz and Guerrero (with an assist from Julie’s brother, Reynaldo) paid for Saffron — the former Susan’s 5100 Bistro. “We’ve been eyeballing that location for a long time,” said Carlos, who’d considered the corner cafe when the former owner had it on the market many months ago. “It was too expensive for what was in there.” Then, months later, driving past on his way home to Rainier Valley, he put the brakes on when he saw a “For Lease” sign in the window and immediately called the landlord. Like Hurley, the former owner had vacated the building abruptly, leaving neighbors wondering what gives. Shortly thereafter, the landlord came to Dulces for dinner, offered to lease the space “on a handshake,” and that — said Carlos — is the story of how the 5100 Bistro became the newly remodeled Saffron, offering 40 seats, beer and wine and a menu influenced by Spain, France and Mexico. Weekday lunch includes the likes of chiles rellenos, chilaquiles and croque monsieur with prices topping out at $10. For dinner, served Tuesdays through Saturdays, there’s bouillabaisse ($20), chiles rellenos ($18) and rigatoni with chicken ($19). Weekend breakfast (offered from 8 a. m. to 2:30 p.m.) includes huevos rancheros ($8), corned beef hash ($8.50) and pueblo pancakes ($8.50) — a big seller way back when the original Dulces bakery and cafe opened in West Seattle in 1992. “Dulces is a well-oiled machine compared to Saffron,” Julie Guerrero told me early this morning. As chef, she’s keeping busy with two restaurants, cooking breakfast and “troubleshooting in the evenings” at Saffron while also overseeing the kitchen at 13-year-old Dulces. She and her husband have high hopes for their Seward Park bistro and expect to tweak both menu and decor as necessary to better serve their neighbors. Carlos will spend time today tracking down acoustic tile and curtains — to dampen the reverb from the cafe’s hard surfaces. But before he did, he took time out to ponder the fate of Coupage, one of umpteen restaurants that have given it a go at that single Madrona address. Referencing the reinvention of the nearby French Bistro Mazarin as the charming and well-received Bistro Turkuaz, Carlos suggests (with reasons near and dear to his heart and wallet) that Madrona could use fewer French- or Spanish-accented bistros, “We’re hoping if someone else is going to do a restaurant there, they’ll do something different. Like? “Like a good pan-Asian restaurant,” he said. Or a sushi bar. Or even a little specialty foods shop like the original Plenty — one of the aforementioned places that inhabited the storefront where a dead Coupage now sits, dark and vacant.